I love individual desserts! 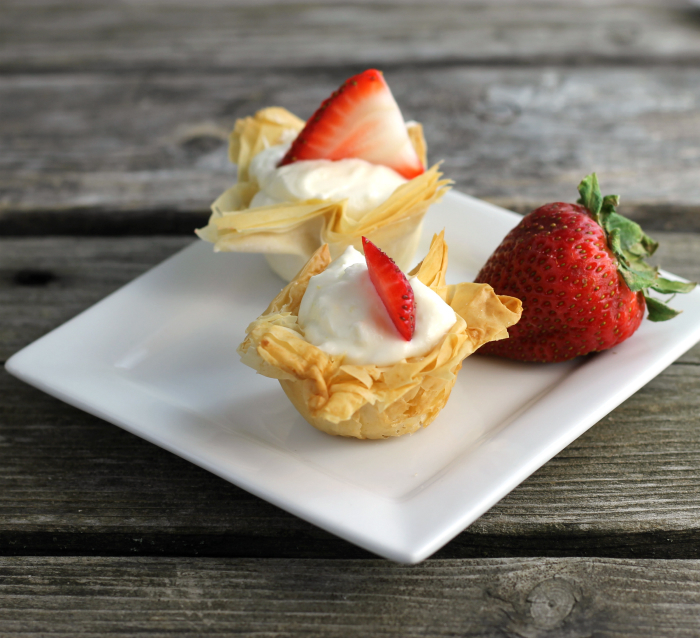 For example, these tangy lemon cream cheese filled phyllo cups, they are my new favorite. After my last post black bean and ham bone soup, I thought I would bring something that looked more appealing. 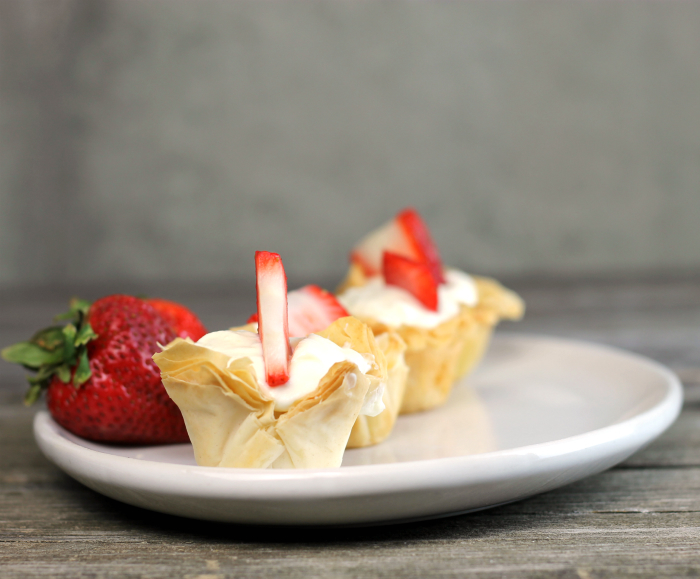 So I am really excited about these tangy lemon cream cheese filled phyllo cups, not only are they beautiful to look at but they are yummy, too. 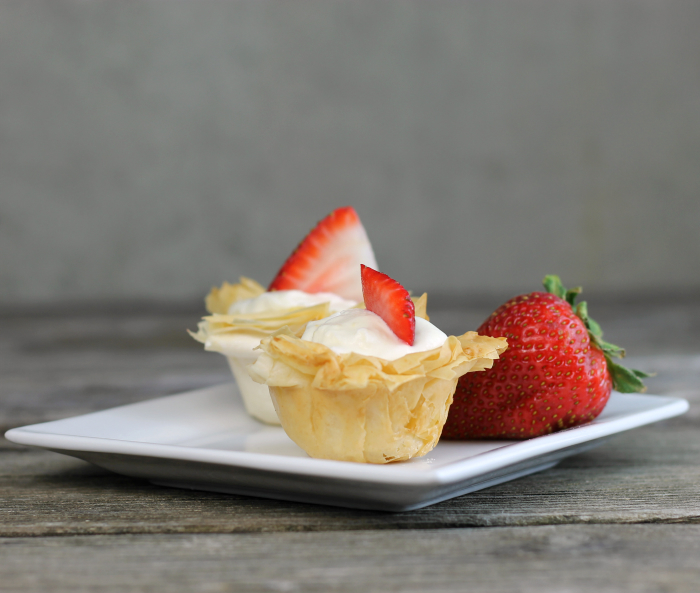 The funny thing about these phyllo cups is that I bought the phyllo dough by mistake. What I really was looking for was puff pastry, but the phyllo dough was cheaper so I grabbed that instead. I had never made anything with the phyllo dough before, so I wasn’t quite sure what to expect. You are probably saying dah, mixing up phyllo dough for puff pastry. I know, I know. I won’t make that mistake again!! Since I had the phyllo dough, I thought I had to make something with it, right? The first thing I made was a disaster. I made a strudel that tasted delicious, but the filling was bursting out of it. At this point I had used half of the dough, I really considered throwing the rest of in the garbage. But I really hate to waste food, so I thought long and hard about what I should do with the second half. Since I love individual desserts I thought about making dessert cups out of the phyllo dough and filling them with some kind of filling. Since I had lemons in the refrigerator that I wanted to use, I decided on the lemon for the filling. The dough layers are brushed with butter and then sprinkled with a small amount of sugar. The creamy lemon cream cheese filling has a nice tang to it, so the slightly sweet crisp shells compliment the tangy lemon filling. The slice of strawberry is optional but goes really well with the lemon filling. 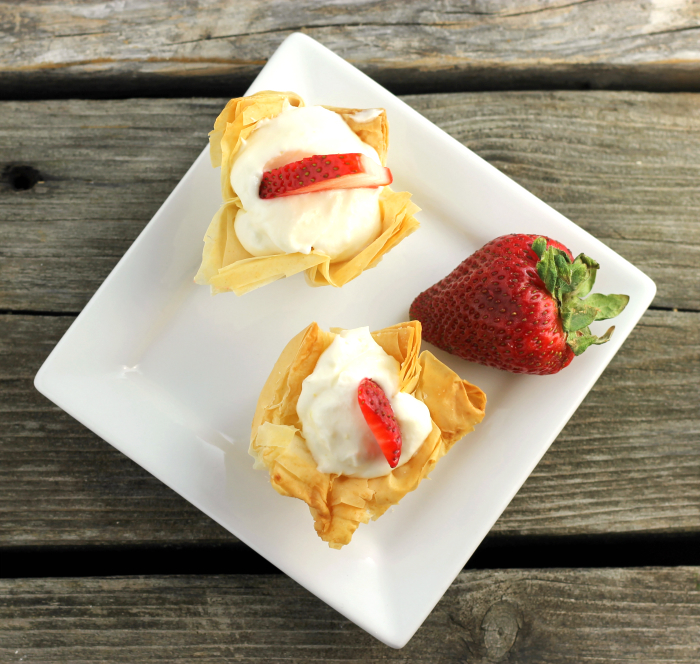 If you are looking for an easy dessert that everyone will love, you really should think about making these tangy lemon cream cheese filled phyllo cups. Thaw one roll of phyllo sheets. Layer 8 sheets of the phyllo dough. Brush each sheet with butter and sprinkle with sugar, before topping with another sheet. The sheets that you are not using will need to be covered or put in a plastic bag and a damp cloth put over them to prevent them from drying out. Once you have layered all, using a pizza cutter, cut the sheets into 3 by 3 square or 12 squares. Place each square in a mini muffin tin. Using your fingers to push the center down into the muffin tins. Place in the preheated oven and bake for 13 to 15 minutes or until they are golden brown. Remove from the oven and take out of tins and cool completely. If the centers are puffed up, gently push down with fingers. Once the shells are cooled make the lemon filling. In a medium bowl beat the whipping cream until stiff peaks occur. In another bowl beat the cream cheese with the lemon zest until light and fluffy, about 2 to 3 minutes. Add the lemon juice and powdered sugar and beat in until well combined. Fold in the whipped cream. Fill each cup with a tablespoon or so of the lemon filling, Top with a slice of strawberry. They are so beautiful! I love low fat filo pastry. This recipe sounds so delicious! And your photos are just amazing. Thanks for sharing. They look so cute and YUM! I have totally almost made that phyllo dough vs puff pastry mistake, too! Both are delicious…but kinda hard to interchange. 🙂 I think you did an excellent job here with that other half of the phyllo dough. I could go for a couple of these lemon cups today. Yum! I definitely need portion control for a dessert like this! The filling sounds amazing, Dawn! These are lovely! I wish I could reach out and snatched one. I make strudel with phyllo, and I love it. I wonder what happened? Too much filling?